Don’t you just dream of your car paintwork being completely perfect all the time, no scratches, no dents and no stains! But we live in the real world, and unless you lock your car up in a garage and instead ride the public transport every day, then it’s inevitable that you’ll pick up some sort of blemishes on your car. 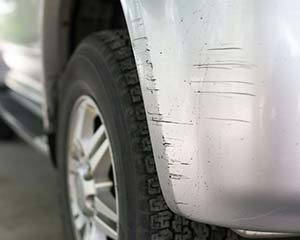 Not only do scratches and dents make your car look unappealing, but they also make your potential resale value drop. Moreover, leaving them unattended to could possibly lead to further damage, such as rust problems. However unavoidable marking your car might seem, it’s good to be aware of what everyday things might be the culprit of your paint damage, so read on for the common causes. Winter is not much of a popular season, because when it comes round, it seems to never want to leave! If you’re one of those people that like winter, then it’s probable that your car has the opposite opinion on it. Mud, sleet, road salt and snow all gather on your car in winter, and can be harsh on your paintwork, often dulling your paintworks shine and making it more inclined to rust. We all know it tends to rain all year round in the UK, which can be a headache for your cars paintwork, due to stubborn water spots. These are formed when the rainwater on your car evaporates and leaves behind minerals on your car’s exterior surfaces. If you don’t wash your car regularly, then these can be harmful to your paintwork. Solution: Create a car washing schedule to remind yourself to clean your car frequently enough to avoid any long-term damages. Similar to how sun rays can be harmful to human skin, they can also be damaging to a cars paintwork. If you let your car sit in the sun for long periods of time, you run the risk of your paintwork fading, cracking or peeling. Solution: Avoid parking in direct sunlight for extended periods. Find a nice shaded car park if possible. If you will be parking for a long period in the sun, consider investing in a car cover. One big mistake you can make is assuming that generic household cleaning liquids, such as washing up liquid, can be used to wash your car just like they’re used to clean your dishes. They will do nothing but harm your wax coating and damage your paintwork. Solution: Be sure that you have an appropriate car cleaning shampoo that will be thorough yet gentle in removing the dust and dirt from your cars paint. One of the most aggravating feelings in the world is finding out that your car has been a target for bird droppings. Not only do they look disgusting, but they can also cause substantial damage to your cars paintwork. The droppings are acidic and can, therefore, corrode away wax coatings and eventually damage the paint. Solution: If you see that the droppings are fresh (however gross that may sound) try to remove it as quickly as you can, by wiping the area with a clean microfibre cloth and washing the affected area. It is very difficult to avoid getting dead bugs splattered on your car, but you can try to remove them as swiftly as possible, to avoid your paint from getting lasting damage. Similar to bird droppings, dead bugs are acidic and can cause the same consequences as bird droppings; ruined wax coating and injury to paintwork. Solution: Bugs are small and not always easy to spot but if you do see one, washing the local area is sufficient. If you’re washing the car regularly then this isn’t going to be a problem. Whether it’s if you have children that leave messy fingerprints on your car or your vehicle becomes a victim to those cheeky bystanders that leave annoying ‘wash me’ notes, writing on dirty paintwork with a finger can cause damage. It may seem harmless, but when a finger writes in the dirt, the fingerprint grinds the debris particles into the paint and can scratch it, thus leaving a long-lasting imperfection. Solution: There’s not much you can do to stop others from scribbling on your car, other than keeping it clean so they stay away! Solution: Don’t drive too close to the vehicle ahead. Leaving plenty of space will reduce the number of stone chips which successfully land on the body of your car. Have you ever been fuelling up and accidentally splashed some fuel onto your car? They were only tiny spots, shouldn’t be a problem right? Well, if you don’t wash it off straight away, it can become a problem. Petrol, diesel, engine oil and brake fluid can often stain your paint and can even cause it to peel. Essentially, it’s a race against time, the longer you leave any type of fuel on your paintwork, the more harm it will cause. Solution: Be careful when filling up and try your best to avoid spillages. If you slip up, just be sure to wipe the splashes away as soon as possible, to avoid them drying and staining. If need be, wash the local area. It might not seem like that big of a hazard leaving your car near a construction site, but on top of the high dust concentration, you run the risk of possibly getting splatters of wet concrete on your car. If this concrete dries on your paint and you have to scrape it off, it will leave behind noticeable marks and dents. Solution: Avoid parking close to a construction site and always observe the signs that restrict access/parking. Whether it’s dust, dirt particles, dead bugs or tree sap, your car gets covered with countless contaminants every day. If you neglect to clean your vehicle regularly, you run the risk of paint damage and eventual rusting, resulting in you having to dish out for some costly repairs. Solution: It is recommended to wash your car every fortnight, but it really depends on your circumstances. For example, if you commute every day on country roads, then come home and park your car under a tree all night, you will probably have to wash your car every week due to the high amount of dust, dirt and tree sap that collects on your cars paintwork. If you want some more information on this topic, check out our article: How Often Should You Clean Your Car? If you use a sponge or a cloth on your car that has fallen on the floor or is quite dirty, then you’re running the risk of scratching and marking your cars paintwork. This is due to the dirt particles embedded in them being quite abrasive on the paint, resulting in damage. Solution: Ensure you use a clean micro-fibre cloth for drying your car opposed to a regular dishcloth, to avoid leaving minute scratches on your paintwork. The best time to repair any scratch, dent or chip is whilst it is fresh because the longer you leave it, the more chance you have of facing a rust problem instead. Then not only will your car be suffering, but your wallet will take a hefty hit too. So if your car has been a victim to any of the causes of paintwork damage above, then contact Bodyteq today for a free quote. We’ll inspect any casualties to your car body and repair them swiftly & efficiently!